Set meals are a common tableau when it comes to the Filipino dining scene. One only needs to take note of the superfluity of restaurant value meals or the preponderance of the silog portmanteau (just look at our tapsilog, longsilog, tocilog, etc.) on the menu of many roadside canteens to realize this. The Japanese have likewise cultivated their own set meal custom with teishoku – meals consisting of rice and soup, accompanied with three dishes (one main and two sides). 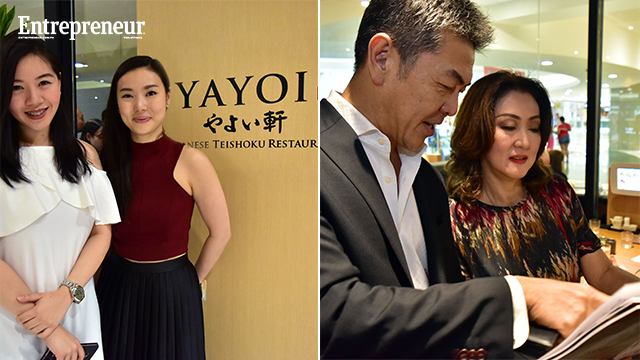 It is upon this common cultural thread that business partners Yvonne Yao and Jacqueline Gobing are banking the marketability and prospective success of the Yayoi brand of Japanese dining in the Philippines. 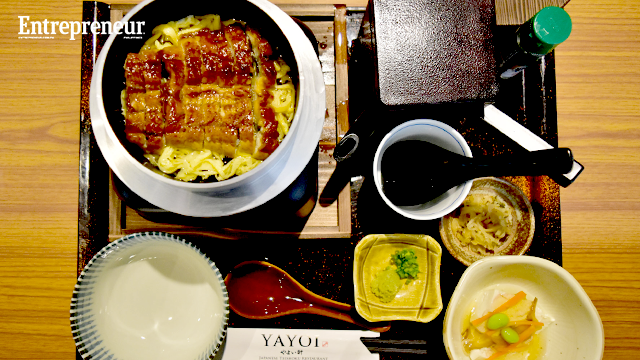 “When we looked at the menu, we knew the items would be very appealing to the market because it doesn’t just focus on ramen, it doesn’t just focus on tempura or just teppanyaki,” Yvonne said as she explained what convinced her that the Philippine market is ready for the dining experience that Yayoi is offering. While Filipinos are no strangers to Japanese fare, many contemporary Japanese restaurants in the country specialize in only one type of dish, as typified by the slew of ramen eateries, katsu houses, and sushi and tempura bars. 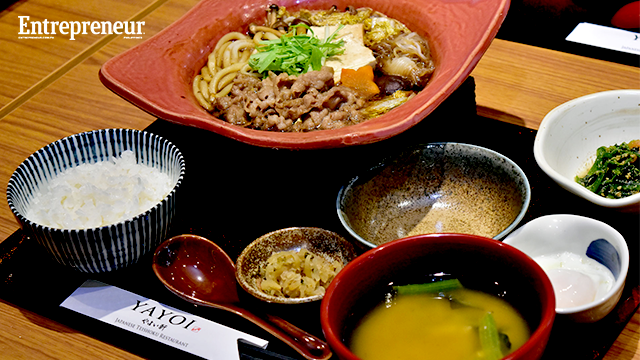 Yayoi, on the other hand, offers a wide variety of food and beverages, taking inspiration from the wisdom of Japanese culinary tradition with its teishoku dining concept. The teishoku set meal, where all course dishes are served together in one go, is based on the ichijÅ«-sansai (literally meaning “one soup, three sides”) traditional meals offered at Zen temples, typically comprising a main dish of meat or fish, a bowl of miso soup, a steaming bowl of rice, and side dishes of vegetables and tsukemono (Japanese pickles). Commonly served in local eateries and family restaurants in Japan, teishoku is very much akin to Japanese home cooking and is seen as the Japanese equivalent of getting a quick home-style meal away from home. The teishoku dining concept was established some 130 years ago during the Meiji period when Japan opened its doors to the west. It was during this era when Yayoi’s founder, Tamijiro Shio, a professional chef trained in France, opened the first Yayoi-Ken in Tokyo in 1886. Since then, the Yayoi brand has grown into a successful restaurant chain which has expanded to over 300 outlets in Japan, Taiwan, Singapore, Thailand, the United States, Australia, and now the Philippines. “There are a lot of competitors here in that there are a lot of Japanese restaurants. But we have never heard of any that serves teishoku,“ Yvonne asserted. It is a bold venture for her and her business partner, Jacqueline, in having decided to set up the first franchise of Yayoi in the Philippines. Yet perhaps much bolder are their expansion plans for the following years. “So far, we are thinking of opening 15 outlets in the next 5 years. So if you compute it, that’s basically three in a year. That’s our main goal,” Yvonne declared. Hirotake Saito, CEO of Plenus Global, the corporate principal handling the Yayoi chain, indicated similar projections while further stating that 20 will probably be the maximum number of outlets they will open. This is in order for them to properly control the quality of their operations. In Japan, many restaurants find it convenient to provide meals as teishoku, because this allows them to streamline their menus and thus lower their overheads. This results in rather affordable prices, which in turn make restaurants that provide teishoku a filling and economic favorite of students and working professionals. And unlike with more traditionally Western restaurants – where it’s likely that one will first be served a starter or soup, followed by the main dish and some small dessert at the end, while in between all of these, one will run into some waiting time and constantly call on the waiter – teishoku-style restaurants offer a much more straightforward process. 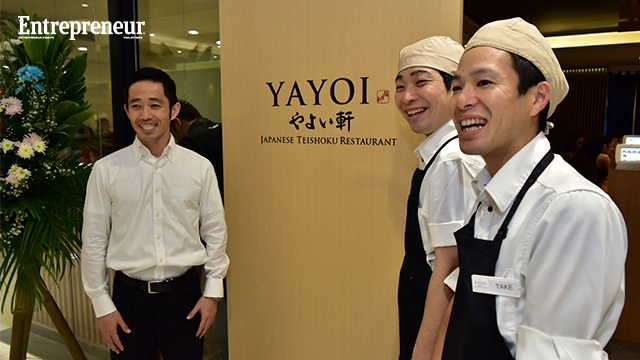 Though the Yayoi brand caters to the more upmarket clientele, the fundamentals of teishoku dining remain the cornerstone of the Yayoi business ethos. 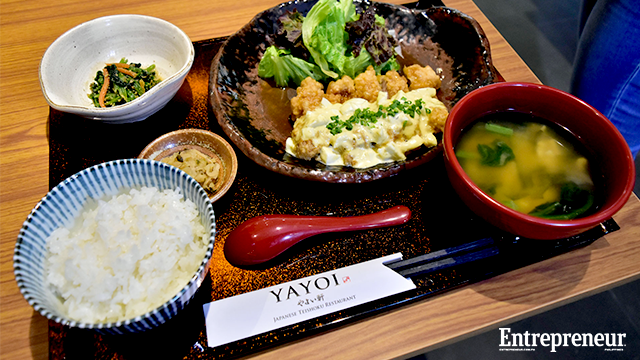 The teishoku philosophy is not only apparent in Yayoi’s food items, but also in the restaurant’s East-meets-West, traditional-meets-contemporary approach. 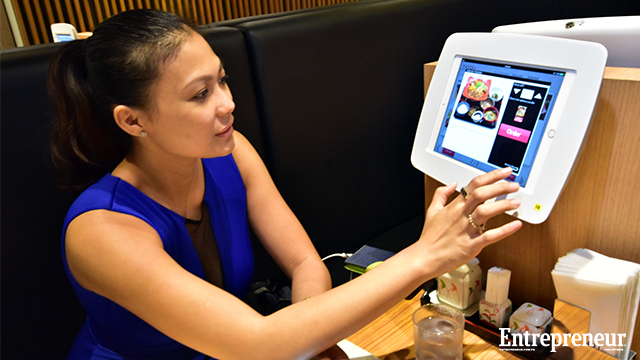 A nod to the Japanese flair for all things techy, Yayoi’s electronic menu and touchscreen ordering system makes use of iPads on which customers can tap their choices, monitor the status of their orders in real-time, and call for the bill. This franchise’s debut in the Philippines, heralded by the recent opening of its first outlet at the 3rd Floor Bridgeway, Building B of SM Megamall, can further broaden the Japanese cuisine arena in the country while introducing Filipinos to a new style and philosophy in dining, one teishoku tray at a time. As a photographer and writer, Zean Villongco has had his works published in numerous local and international magazines, newspapers and websites. As owner of the digital media studio Big Squid Creatives, he handles graphic design, web development and video production for various multimedia clients. He swims, bikes and runs, and travels a lot.